Gower is a great place to go walking, whether your preference is to walk on the hills, the beach or over the commons. You will need walking boots or sturdy shoes. There are ideas and directions for walks in the Guest Information folder at the house. 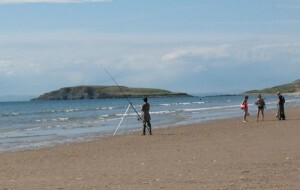 Llangennith beach is popular for fishing; seabass and mullet are often caught. Gower Coast Adventures – book at www.gowercoastadventures.co.uk or 07866 250440. Swansea has all the attractions of a big city: museums, cinemas, shops etc. About 1 hour by car from Llangennith (on A48 follow signs from M4 J38) 850 acres of parkland. Wales’ first Go Ape course (www.goape.co.uk). Special events throughout the year. Simply Play: Indoor soft play in Gorseinon (not far from J47 of M4) for children up to 12 with baby and toddler areas. www.simply-play.net or 01792 224904. Great for kids if weather not kind.